Like most predators, ferrets conserve their energy for the majority of their time through sleep. Ferrets may sleep for up to 18 hours a day! Since the majority of their time is dedicated to sleeping, it is important for them to have a comfortable space to do so. 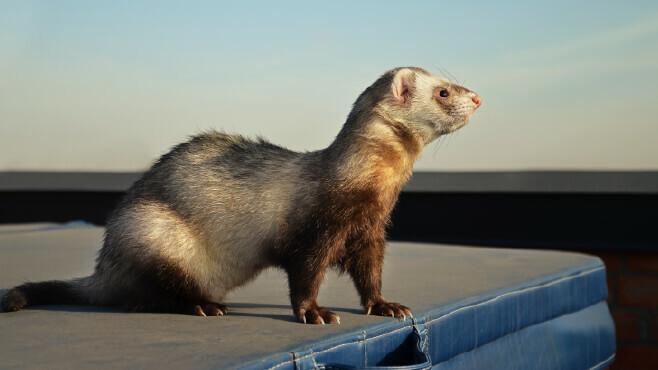 Ferrets are naturally most active during dusk and dawn. (This is also when their eyesight is best!) In addition, they descend from polecats that sleep in burrows below the ground. This means that ferrets require complete darkness and a quiet, cozy sleep environment. 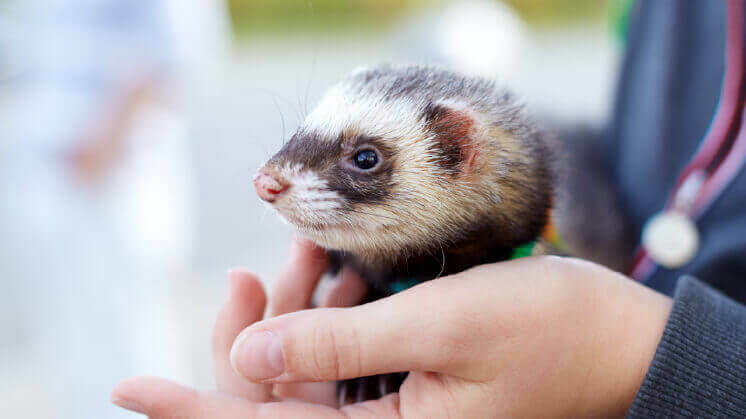 Ferrets that are exposed to too much light and don’t have access to covering will not sleep well and may develop behavioral and health problems. How many ferret beds should you have in a cage? Ideally, you want to have a few different beds in your cage for your ferret to choose from. Since they spend most of their days sleeping, they like to have more than one choice in sleep spaces. Multiple sleeping spaces fulfills that desire and keeps their cage a bit more interesting. It’s best to have lots of different kinds of bedding, set up different bedding options throughout the cage, and rotate the different bedding types between washes. 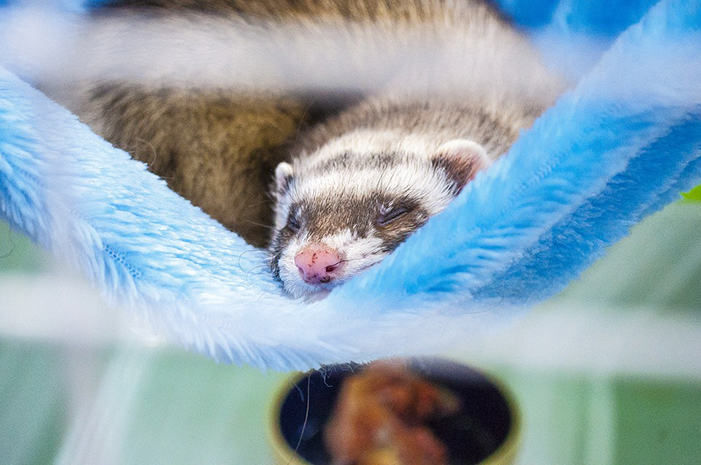 Blankets — The staple bedding that most ferret owners use is simple fleece or cotton blankets. Natural fibers tend to be more breathable and may be a better option for your ferret’s comfort (and are better for the environment). 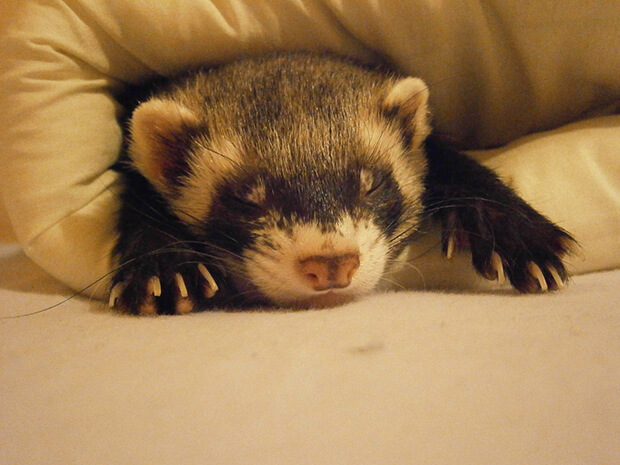 Ferrets love blankets because they allow them to crawl into a dark space. They also love the ability to adjust the blanket to their bodies and create a little cocoon. Blankets create a soft, warm, dark, and snug space for sleep. They are also durable and easy to wash, making them excellent for ferret owners as well. Another similar option is sleep sacks, which are fabric sewn to create a three-sided bag big enough for a ferret to crawl in and curl up to sleep. Hammocks — The other staple that all ferret owners should have in their ferret enclosures is hammocks, both open and enclosed. Ferrets like the sensation of being suspended while sleeping. Hammocks typically hang in a higher area of the cage, which the ferret needs to climb to in order to reach. This provides some mental and physical enrichment in the cage. Open hammocks allow the ferret to sleep uncovered if they wish, while enclosed hammocks allow for the ferret to burrow themselves into the hammock and be surrounded by darkness while they sleep. You might find that your ferret preferes the open hammocks in the warmer months and the enclosed hammocks in winter. Novelty ferret beds — Some companies have designed novelty beds which are a bit more fun looking, resembling things like boats and crocodiles. 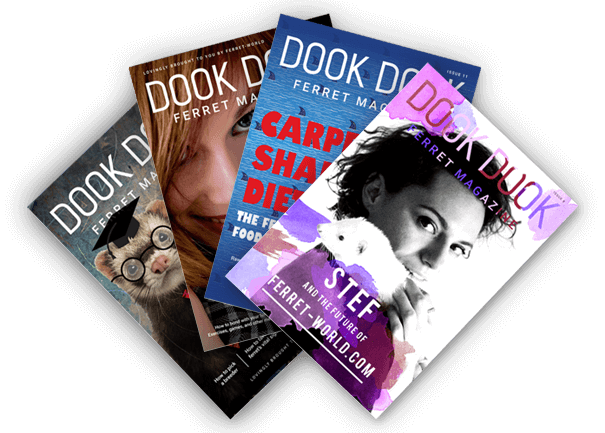 Some of these even include attached toys that can be fun for the ferret. When purchasing novelty beds, make sure they are specifically made for ferrets, are well made (check the stitching), and are made of good-quality material (preferably natural fabrics). 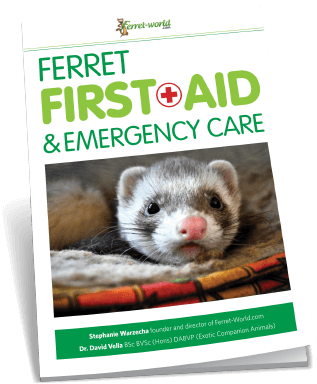 Beds that are not made specifically for ferrets, that are made poorly, or that are made of poor materials can be a safety hazard for your ferret.